So… what’s the weather like there? It seems the three questions I have been asked most since arriving are: What are the people like? What’s the weather like? And what’s the school like? It seems winter really did come back with a vengeance, at least that’s how it felt last Saturday, as I darted around the old town in and out of cafes and bars sipping hot chocolate and wine respectively to avoid the chilling -5 wind in the city centre! This biting cold hung around all weekend, with snow predicted for Sunday evening. Emerging from Tesco Sunday evening, the roads, car park and cars had indeed been dusted with the white stuff, and people looked on alarmingly at our shrieks of joy, whipping out our cameras to capture the moments of our first snow! Everyone wished me well, in my “winter wonderland” adventure, which I had started to disbelieve until I woke up on Monday morning and the snow had continued to fall throughout the night. I marvelled at the fact that at 7am, the footpaths and pavements were already cleared and people were going about their daily business without a second thought. I walked around the city with a stupid grin plastered on my face for the following three days as it continued the snow constantly and the city continued to function flawlessly. I found myself amazed to see men in orange jackets out early in the morning, shovelling the snow away and to see mini snow ploughs driving along pavements pushing it away and dropping salt in its path. I was standing at the tram stop, simply in awe of the fact that everyone accept me was totally non-plussed when a van screeched to a halt and 4 men jumped out with determined looks on their faces. 3 grabbed shovels from the back seats and one heaved a bag of salt onto his shoulders and off they scuttled down a cobbled street shovelling and salting. Perhaps it’s only in the UK where normal functions stop. Cos in this city, you wouldn’t even know it was snowing, apart from the increased number of people wearing fur coats, the odd child in a snow suit and perhaps people whipping out an umbrella now and again. Although the pavements were salted as soon as the first flakes fell, the other day paths were covered as quickly as they were shovelled, making some places slightly difficult to negotiate. I watched in alarm as an old lady crossed a particularly slippery crossing with no one to help her neither the aid of a stick and then reminded myself that she has been doing this every winter all her life and it’s probably only me who needs to be cautious here! What I know about Bratislava and its people after a week…. The men all look the same. The women have an obsession with nasty heeled boots and usually pair these with a shiny puffa coat of the same colour, nicely topped off with some fur, usually on the head or trimming whatever they are wearing. They also like their perfume strong, really strong. Scarves are tied outside the neck of your coat. They want to help you: especially on buses. I learnt this on a rainy day this week when three attempts to tell me something useful were made on the same bus journey. First a man was desperate to remind me that the front pocket of my bag was open. Little did he know that after 5 years in Barcelona I never carry anything of value within reach of anyone (or myself as I am often scrabbling for my wallet from some deeply hidden pocket). The second was a girl asking if I wanted to get off the bus when I was straining to read the name of the stop. Of course I haven’t had the chance to learn “no thanks, I was just checking to see where we are”. And the third was a woman who needed to tell me that the belt of my coat was trailing the floor as I stepped off the bus. It took a few full circles for me to see what she was pointing to, but we got there in the end. If someone asks you if you’d like tea, coffee or water, then tea will come black and unsugared, coffee comes black and water is always fizzy. If it’s raining, stand at least 2 metres away from the kerb. Not all bus and tram stops are listed on the scrolling screens inside vehicle and when you get to stop, you can’t get out unless you press the button! Litter seems to be part of the decoration. Despite the fact that rubbish collection points are about 20 metres apart on my housing estate, they seem to like decorating any green area with it. 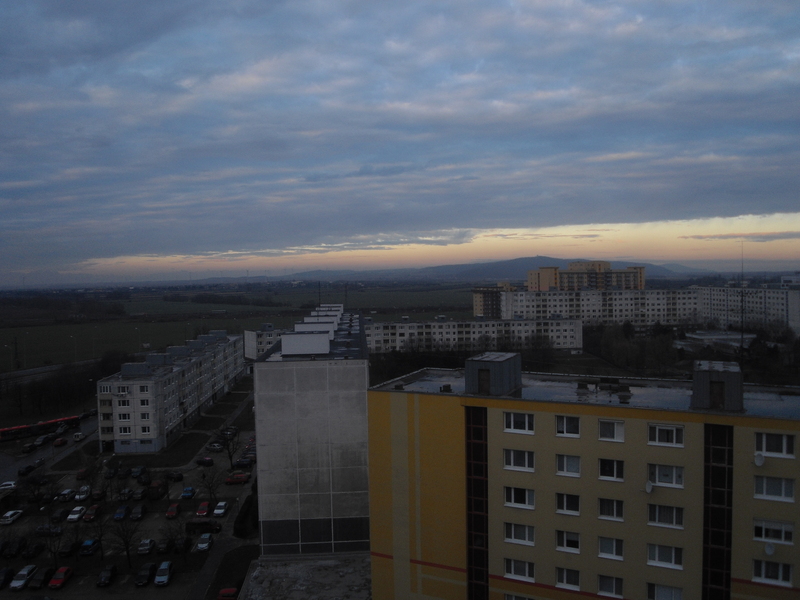 Petrzalka, after a week living there, isn’t as bad as it looks. I have students who work in high positions in the back who also live there. And the badly parked cars are actually quite nice cars. Unless you specify, beer comes in a large glass. Bryndzove Halusky is nothing to write home about. So-called Slovakia’s speciality of sheep’s cheese dumplings topped with bacon reminded me of overcooked tangy macaroni cheese. Oh and Kofola is Slovakia’s post-communism Coke. It’s like coke, dr pepper, dandelion and burdock and root beer all in one glass. I might need a few more before I decide if I like it! Today was what we could call my first “real” day, in that off I went this morning to class after class, navigating my way around Bratislava on the bus, the tram and the trolley bus to destinations I can’t pronounce and places I can’t locate on the map! But without the damp mist that seemed to hover around like a bad smell, the buildings were certainly a different shade of grey and bathed in sunlight the whole city was a totally different place. I set off this morning, my first class having been cancelled the night before, allowing me a generous lie-in until 7.30. I made it into town on bus 95 in plenty of time, marvelling all the way at buildings I hadn’t even noticed before. Off I hopped to make my change at the tram stop, deliberately missing the one I saw approaching, so I could smugly stand and wait knowing I had aeons of time. Tram 12 rattles into its stop, on I get eagerly checking my timetable against stops. It turns left. Did it turn left on Monday? No, having just missed one, the director and I had walked onto another stop for another line. Ok, no problem I think, scanning the screen for my stop. Doesn’t appear. That’s odd. Double check schedule and destination. Yes I am on the right one. Left again. This can’t be right. Off I get, whip out my street map and now I really am on an adventure and a mission. I’ve just got off the tram at a random stop in the middle of a city I have not yet explored and I need to get to a class in 45 mins. Best mistake I have made! I locate the stop I had used on Monday, for Tram 5, and race along cobbled streets towards it. This is Bratislava! Here are the lovely buildings I’ve seen in images of this city, the old churches and cobbled streets. Fabulous, but no time to marvel, got a tram to catch at 19 mins past! I race up the steps recognising the stop from another angle and skip across the road as the tram approaches. Phew. Wait a minute, this tram doesn’t list my stop either, I realise as we jerk into a tunnel. Ho hum. What to do. I soon realise that only the MAIN stops scroll across the screen and the dear old tram stops at them all. This is confirmed as I step off at destination stop Svanterova and number 12 comes squeaking up behind it. Oh well, learnt something about the trams. Along I skip, still very pleased with myself. I still have 20 mins till class and will arrive with more than enough time. This nasty looking housing estate is not a glum as it was in the fog, in fact the buildings are painted rather oddly in oranges and yellows. Yes… orange and yellow tower blocks. The school looks much cleaner and brighter as I approach and again I smile to myself at how easy this all is. I arrive slip on shoe covers. The Children remember my name and take very well to my new English Only policy (and strict it is too!). Two hours later, I saunter, yes saunter because I have 2 hours to get to my next class back to the tram stop. This time I hop on Bus 83 for about 12 minutes and get off at a totally random place Sokolska to then catch the trolley bus. At least I am seeing the city now, although cleaner windows would be nice. I’m not looking forward to the next class cos a fellow teacher “helpfully” warned me that they were difficult to teach and the class was miles away from anything. When I arrive at Trnavska I spot a café next to the bus stop (He told me he’d walked for miles to find one!). It takes ages to cross a rather complicated road and as I am still 45 mins early I enter the “fresh food market”. This is weird. It’s nearly empty bar about 10 open shops which either sell fruit, veg, bread or a combination of the lot. There are some stalls selling food with tables too, but I am only brave enough to buy a mandarin and a pastry. It’s going to take a while since I answer every question with “Si”, greet people with “hola” and thank people… you know how it goes. After that class, I have to navigate my way back out and then find bus stop 50. This drops me at another random location Wustenrot where I whip out my street map (this is a street map, bought here, NOT a tourist guide) and enjoy working my way back to school. It’s now 3.40 and I have a substitute class to cover in less than an hour and everyone wants to know how I got on today. How nicely annoying. One to one class takes place in a classroom at the top of the building, to which I am given a special key. Student is waiting when I arrive. He is surprised I am not Mike, but after that initial confusion, the hour flies by. 5.30, can’t go home yet cos photocopies have to be made for my 7.30 class tomorrow nd everything I taught today has to be typed into the online agenda. Orange tower blocks of Batkova, near the school I teach at 3x week. So…. 24 hours in…how does it feel? Well, it so rarely fits the pictures you had in your head and this is like none of the images I conjured up of a fairy-tale-like city with a rising castle and crispy air and smiling people and either a wintery snow covered landscape or a crisp deep blue sky. Yes, I DO live in the “eastern block”, as in I live in a place that from first glance you would assume to be a NASTY council estate. Petrˇzalka. Yes, grey tower blocks, litter and badly parked cars. I live on the 13th floor of a building whose entrance would make you not really wish to proceed. The journey into the centre is pretty ugly until you actually get to the bus stop in the centre where there are some nicer looking buildings. The tram is pretty nasty looking, often with graffiti or advertising cleaning products. Not the quaint rickety wooden tram you picture trundling along cobbled streets. The weather has been grey, damp and misty, so hasn’t painted the city in the prettiest light. The “school”, as in the primary school where I am teaching is on another of these delightful housing estates, again where at first glance you wouldn’t want your child walking there alone. BUT on entering, you are encapsulated by the most charming environment: decorated beautifully and delightfully inviting for children. You are instructed to wear slippers in the primary area, or cover your shoes, and although the paint wasn’t painted in perfectly straight lines, the rooms are bright and colourful and a wonderful atmosphere for the children. Of course I must mention TESCO. It IS the world here. It’s not just a supermarket. It’s like El Corte Ingles in the centre with a floor for toiletries , another for clothes and an acre for the actual supermarket. In my “local” one, a hypermarket, I could buy iceskates, a treadmill, a double bed or just a packet of stock cubes. I could also sit down in the café and check my email, pop next door to pizza hut, or even have myself a haircut. I remain optimistic. I arrived open-minded and I am determined to leave knowledgeable of the culture, surrounding countries and of course a better teacher. Oh and I have a Kindergarten class times 2 tomorrow. Three Year olds! Grace is going to write a blog! I went to Barcelona for a one month teaching course: intending to travel the world as an English teacher and “accidently stayed there for 5 years. Oops. Not all bad though: I fell in love with the city, the people and the lifestyle. Oh and the job wasn’t bad either. I learnt the language and just when I was starting to feel “comfortable” I remembered my original reason for becoming a teacher: travel. How had I managed to stay there for 5 years? Ask anyone who has been there that long. It happens. So, in a bid to go somewhere TOTALLY different and start living that “dream”, I chose Slovakia, or it kind of chose me. Where do you start when you have lived somewhere for 5 years?! How do you decide where to go next? Do you choose the weather? A langauage? A continent? Or do you just log onto tefl.com and see what’s going and randomly apply to what you see? I chose the latter method. And so it transpires I will very soon be living in Bratislava, the Capital of Slovakia. I want to write a blog becuase all I really know about this, is that this adventure will throw me out of the Mediterranean comfort zone I was living in and into the totally different world of Eastern Europe, which I know very little about. Why such a change of lifestyle? Well, Why not?! So as this is my first post, and first ever blog, forgive me for rambling on, but I thought it best to layout my reasons for writing it before I get there and what already know about life in Slovakia…. First of all, I will admit that before I applied for the post, I had to google Bratislava to find out where it was. What I discovered was that it is the capital of Slovakia, situated on the River Danube and so named “the heart of the Danube”. It’s right on the boarder of the country and about an hour from Vienna. Once called Czechoslovakia, it split into Czech Republic and Slovakia in 1993 ( Ok, I researched that), but try telling this to my Grandmother who doesn’t understand these concepts and tells all her friends I am going to a place called “check”. Their main export according to the Lonely Planet is Ice hockey pucks (spelling?) and they are renound for beautiful women! They like their beer (pivo can’t go to a new country without that word firmly in one’s memory!) and goats cheese dumplings! Right now it’s 2 degrees and snowing lightly in Bratislava, but in the summer it can get well above 30. I have learnt how to say hello, good morning etc, please, yes, no, beer and wine. Done. Got a LP for Czech and Slovak Republics and phrase books for the surrounding countries. I’ll be living in a very basic flat with 2 other teachers and I’ll be teaching a range of different class types from business classes to kindergarten. That’s Nursery to us Brits! Oh! and the timetable will be the opposite to Spain with most of my days starting before normal working hours. ouch. So there you go. That’s what I know and what I’m in for. I always have a lot to say about what I do and where I go, so if you want to come along for the ride, then subscribe to my blog and join me! Photos will be posted too.